Sometimes called the lazy person’s Persian, the exotic has the same body and head type as the Persian but with a short, easy-care coat. This breed is great for those who love the look and personality of the Persian but hate the daily grooming the breed requires. Second only to the Siamese among the shorthaired breeds and fourth most popular breed overall, the exotic has seen a steady rise in numbers and popularity in the last decade. But is the exotic just a shorthaired version of America’s most popular breed? No, say fanciers. The exotic has its own history, personality and growing group of devoted fans that swear by the plush, cherub-faced, solid-as-a-brick feline. In the late 1950s, breeders began secretly breeding Persians into their American shorthair (ASH) bloodlines in an effort to improve the body type and to introduce the color silver. As a result, the ASH took on Persian characteristics. Their faces became rounder and broader, their noses shorter, their ears smaller, their bodies more compact and their hair longer, softer, and denser. Some liked the new look, but others who had worked hard to bring the ASH the respect it deserved were appalled at the changes. They didn’t want to see their breed become a pseudo-Persian. The ASH standard was revised to disqualify any cat showing evidence of hybridization, and those Persian/American shorthair hybrids were out of a job. In 1966, however, Jane Martinke, a Cat Fanciers’ Association (CFA) judge and American shorthair breeder, proposed that the hybrids be recognized as a new breed. At first the breed was controversial. The Persian breeders opposed acceptance of the hybrids and refused to sell their good Persian stock to exotic fanciers. However, fanciers persisted, first using Persian and ASH bloodlines and later Burmese, Russian blues and British shorthairs to establish a gene for short hair. After the dominant shorthair gene was established, the breeders bred back to the Persian to achieve the preferred body and head type. In 1987, the CFA closed the exotic to shorthair outcrosses altogether, leaving the Persian as the only allowable outcross. Gradually, the exotic won over the opposition and today this popular breed is accepted by all the North American cat associations. Except for coat length, the Persian and the exotic now have identical standards. Dubbed “a Persian in its pajamas,” the exotic is a solid, rounded, stocky cat. The body style is called cobby, a cat fancy term that means the cat has a short compact body with broad shoulders and rump. The eyes are large, round and set far apart, and the cheeks and whisker pads are rounded, contributing to the sweet expression so prized in this breed. Small, rounded ears set wide apart on the broad head add to the impression of roundness. The cobby body style is easier to see on the exotic because the cat lacks the long coat that tends to soften the body’s lines. Not everyone likes the extremely broad, flat face of the show exotic, however. Those who favor the traditional or doll face Persian, which has a less flattened facial type than the extreme Persian, will like the traditional exotic. Recently accepted by the Traditional Cat Association, Inc. (TCA), the traditional exotic possesses the less extreme facial type of the traditional Persian. Since the traditional doesn’t have the extremely flattened face and very short muzzle, fanciers report fewer breathing and tear duct difficulties. The extreme exotic, however, is favored in the show ring. The exotic and the Persian share similar traits, but because of the American shorthair influence, the exotic personality is slightly different from the Persian’s. Exotics tend to be more active and lively than the placid Persian. They tend to be a bit brighter, too, although they are still not the most brilliant bulb in the package. They are also more playful and enjoy a good romp around the living room, particularly if you are there to admire their antics or join in the fun. Despite their more active temperament, exotics, like Persians, are loyal, sweet, and affectionate. They are agreeable, non-aggressive, and get along well with other animals and children. Their serene temperaments make them ideal apartment companions, and most breeders recommend them as indoor-only pets – as do the breeders of most purebreds and many of the proponents of random-bred domestics as well. The traditional exotic has the same affectionate, easy-going personality as the extreme. 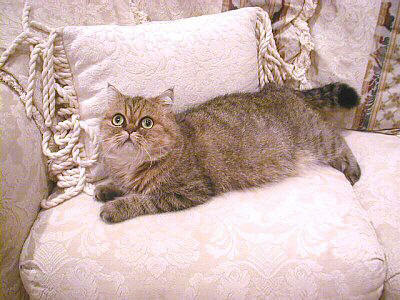 Compared to the Persian, the exotic is easy to groom, but the breed does require some maintenance. Like the Persian, the exotic possesses a rich, full undercoat that can develop mats. Figure on a grooming session with a good quality steel comb twice a week. A once-a-month bath is recommended as well. Exotics with runny eyes need their faces washed daily with moistened cotton balls or a warm, wet washcloth. Pet quality exotics usually run $300 to $600, depending upon area, breeder, color, and pattern. Breeder quality runs $600 to $2,000 depending on quality and bloodlines, and show quality will set you back $1,000 and up; top show can run thousands. Retired show or breeder quality exotics are occasionally placed for a very reasonable price, often just the cost of the spaying or neutering surgery. The exotic is essentially a shorthaired Persian, so it’s no surprise that the extreme exotic has some of the same health problems as the extreme Persian. Polycystic kidney disease (PKD) which can cause renal failure and is known to be present in some Persian lines. Getting a written health guarantee from the breeder is a wise precaution.